This book was a really fun “who-done-it”. It was so addictive right off the bat and throws you immediately into the mystery. I love that the author wastes no time getting to the mystery and the major plot points. When I first started reading this, I texted my sister and said “man I’m getting mad Breakfast Club vibes!” Not that it was a bad thing because the Breafast Club is one of my favorite 80s movies! However, I had a difficult time in the beginning separating the two. Every time they mentioned the character Nate, I couldn’t help but see Judd Nelson’s face flash before my eyes! But once the story got moving, (and it got moving quickly!) The Breakfast Club was soon a distant memory. I really loved all the characters and how they transformed throughout the whole book. They start out as typical high school stereotypes but so much happens to them that by the end of the novel… well let’s just say they are completely transformed. I especially loved the character of Addy. I was so worried she was going to be the typical, popular blonde high school girl sterotype (which she was in the beginning) but by the end of the book she had transformed into a total badass! The writing here is really great. I loved getting the story from all 4 main characters’ perspectives. It made the story flow really nicely and broke up the chapters into a nice, fast paced read. I give this book 4 stars solely based on the end. I WILL NOT ruin the mystery here or reveal who the baddie is but I will say the baddie’s motive for doing what they did was pretty weak. But after thinking about it some, I’ve come to realize that this is teen fiction and they are 17 year old high school students. I remember being in high school where problems seemed so much worse than they do to me today at 28. So if you remind yourself that they are in high school and they don’t always have to be rational, then the ending seems to fit better. Overall, I finished this bad boy in a day and a half. Not even that really; it was more or less like two evenings of reading before bed. It is a super quick and fun read. The cover was so intriguing to me that I couldn’t say no to it. 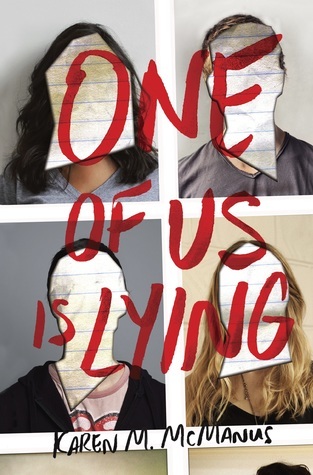 It’s like if The Breakfast Club, Gossip Girl, and Pretty Little Liars had a baby, it would be One of Us is Lying by Karen M. McManus.